You might never have been to Totnes. It’s not the sort of town you stumble upon, tucked away in South Devon and, according to the Welcome sign at least, twinned with Narnia. If it were a family relative, it’d be your older, cooler, vegetarian cousin whose battered leather jacket has a strange herbal aroma, or possibly your young sister who went to work in London in PR but had a career epiphany and decided to make scented candles. To summarise, it’s a funny old place. For every shop selling crystals and incense, there’s another flogging Cath Kidston and Iittala. It’s caught between two worlds; the world where the 1980s never happened, alongside the world that buys Elle Deco and covets an original Eames lounger. These worlds seem to live peaceably together, although I wouldn’t want to be the last man in the deli when they run out of hummus. Badger and I love Totnes and visit regularly. There’s a cracking little bookshop called Harlequin Books, where Billy Bunter rubs shoulders with Jamie Oliver, and Badger is particularly fond of their extensive military section. 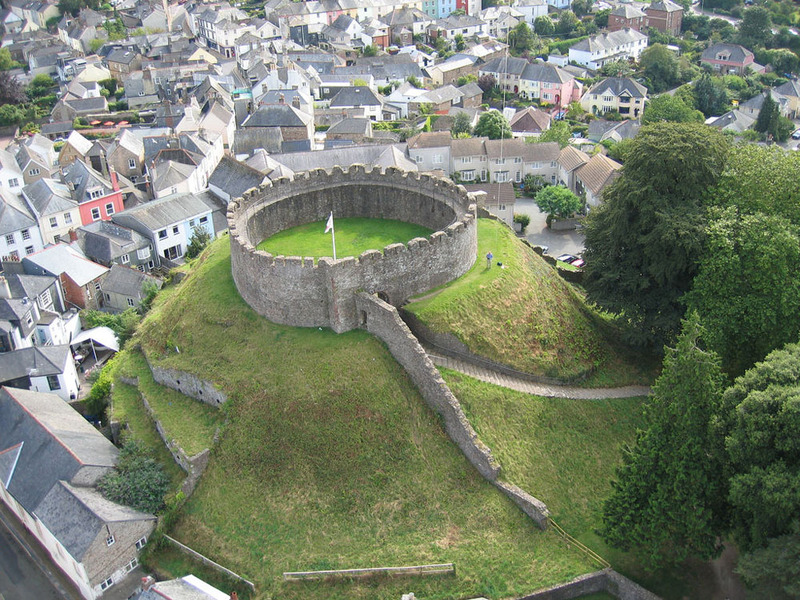 However, the star attraction of Totnes is undoubtedly the Norman castle, which squats over the town like a brooding toad and oozes History from every stone. Last year, Badger and I had the misfortune to get locked in Totnes Castle. It was a warm Saturday afternoon in October; we’d eaten heartily of paninis at the Green Cafe, and we were sat on the grass beyond the castle walls. Badger was reading the Telegraph and I was halfway through Take A Break but tiring of the relentless tales of misery in 1000 words or less. I dozed off and woke much later, to the sound of a Badger trying not to panic in a very British way. The keeper of the gift shop had locked the gate and left – and there was no way out. Of course, there was a very obviously clear way out – down the hillside, across the old moat and into someone’s back garden – but we were no Norman warriors and I was wearing my lovely new Bertie sandals. We were stranded, and it was getting dark. It was at this point that I decided to write a thank you letter to English Heritage. The previous year, we’d spent a brilliant afternoon at Berry Pomeroy Castle, a few miles from Totnes. It’s a wooded, shadowy gem of a place, almost a castle within a castle, and a romantic ruin in the best Gothic bodice-ripper sense of the phrase. Berry Pomeroy has an embarrassingly rich collection of ghost stories – not just a White Lady, but a Blue Lady too, as well the besieged Pomeroy brothers, who rode their horses off the castle ramparts to the valley below, rather than be captured. Totnes Castle has no documented ghosts, but I didn’t fancy staying the night to test this statement. There was something in the blackened stones of the keep and the coldness of the grass as the sun went down that made me feel a bit uneasy. We escaped eventually, of course, with a brave leap from a modest height into a car park, and minimal sandal damage. It struck me that we owe a debt of thanks to English Heritage for keeping these buildings for the nation – for keeping the tales of spurned lovers and doomed brothers alive for yet another generation, in a time where there’s a million other, shinier, newer stories in the world. Even if the price we have to pay is a gift shop that sells over-priced tea towels and Simkins Travel Sweets, it’s worth it – to touch the walls that hold the stories and feel the past around you.